1. All possessing very sharp teeth. 2. Murderous scoundrels, the lot. Book Two of The Wingfeather Saga series. So the Igiby family is on their way to Kimera, to join the colony of rebels hidden on the vast Ice Prairies. The Nameless One still grasps for them, stretching long fingers across the Dark Sea. His trolls, his armies of Fangs are on the hunt for the Jewels of Anniera. If the Igibys manage to evade the forces of Gnag, plus various malcontents and hungry animals, they can then attempt the cold, cold trek to the hidden colony. What could go wrong? More than they would even guess. 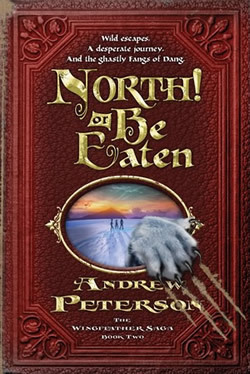 Through over three hundred pages, North! Or Be Eaten details the pitfalls. Climb out of one, fall into another. It’s fun to live in a fantasy novel. North! Or Be Eaten is the second book in the Wingfeather Saga. The silliness is lessened here, but it by no means disappears. Andrew Peterson continues to prove, along with Jonathan Rogers, that fantasy can be very funny. Yet the book has a more serious tone than its predecessor. The dangers are more frequent, and often of a darker nature. This is one of the ways in which North! Or Be Eaten broadens and deepens the saga. Another is one of simple geography. On the Edge* takes place almost entirely within the Glipwood Township and the land surrounding it. North! Or Be Eaten leaves Glipwood behind, traveling to the mighty, dangerous falls, the Strand with its outlaws, Dugtown, Kimera, the Ice Prairies, the Fork Factory, the Sea. The characters, too, are deepened. This book focuses more narrowly on Janner than the other did, cementing his status as the lead character. But other characters are developed even more than he. Podo – who had a great deal of color in On the Edge and not much complexity – gains some. The Fangs, surprisingly, progress from decent, cookie-cutter hobgoblins to something more terrible and more tragic. And if you like Peet the Sock Man – and if you don’t, I wonder about you – you have even more reason to be happy. Peet’s role is, unfortunately, smaller in this book, but it is gold. North! Or Be Eaten is a worthy continuation, a sequel that not only lengthens the story but deepens it. On the Edge was a good book; this one is even better. Exciting and at times intense, with humor and high emotion, it’s a happy experience for the fantasy reader. At least it was for this one. * The full title is On the Edge of the Dark Sea of Darkness, but this takes too long to type. Also, it makes writing reviews harder. By the time I put in that title, the sentence I’m trying to write is already too long.